Do you ever feel like teaching’s taking over your entire life? Are you overwhelmed & exhausted, wondering how on earth you’re supposed to fit everything in? Do you ever feel guilty that you’re always working on schoolwork instead of spending time with your family? Do you see other teachers leave with an empty bag and wonder how on earth they do it? Are you wondering what their secret is and if there’s any way you can ever accomplish such a feat? Well I’ve got some good news to you – shaving time off your workweek is not as impossible as you may think. Let me ask you – what would you do with an extra 5 hours a week? Would you grab coffee with a friend? Enjoy playtime with your children? Go on a date with your spouse? Take a much-needed nap? What would you do with an extra 5 hours a week? Imagine how those extra 5 hours a week would change your life. Now that’s worth fighting for, isn’t it? Let’s take a look at how you can actually make it happen. Teaching is a high calling, one that is worthy of our time and best effort. But if we work ourselves to the point of exhaustion and end up neglecting other aspects of our life, then we are doing no one any good. The truth is that we will be more effective as a teacher when we have balance in our lives, are well-rested, and know that our family responsibilities are being taken care of. Too often we allow guilt to convince us we have to finish one more project, grade one more stack of papers, or create one more amazing bulletin board. But the reality is that there will always be more to do. Always. If you let yourself work until every idea is completed, you’ll be working every spare minute of every day. And that’s simply not sustainable in the long term. Sure, you might make it a year or two. But if you keep up a pace like this, you probably won’t still be a teacher in 10 years. You must realize that you CAN be an amazing, effective teacher while still working a reasonable amount of hours. There are a bunch of great teachers out there who are doing it, and you can do it too if you believe it’s possible & make it a priority. Set a goal and start tracking your hours. Did you know that the simple task of measuring something will typically bring improvement? So I challenge you to try it. Set a goal for how many hours you want to work next week. Then keep track of the hours you actually spend working. Continue to set weekly goals & track your progress & see if you can cut off some time just by making it a priority & paying attention to it. Join Angela Watson’s 40-Hour Teacher Workweek Club. This club is 100% amazing and is helping real teachers just like you to take control of their schedule, find systems to accomplish their tasks more quickly, and reclaim their nights and weekends. What makes the 40-Hour Teacher Workweek Club so amazing is that you’re not going to be overwhelmed by huge books to read or a big collection of videos to watch. Instead, you’ll receive practical tips each Saturday morning, and in the time it takes for you to finish your cup of coffee, you’ll learn actionable strategies to try out in the coming week so you can spend more time with your family and less time with work. If you’re overwhelmed, stressed, and feel like teaching is consuming your whole life, this club is exactly what you need. Angela’s practical tips will help you take back your weekends & regain that precious time with your family. 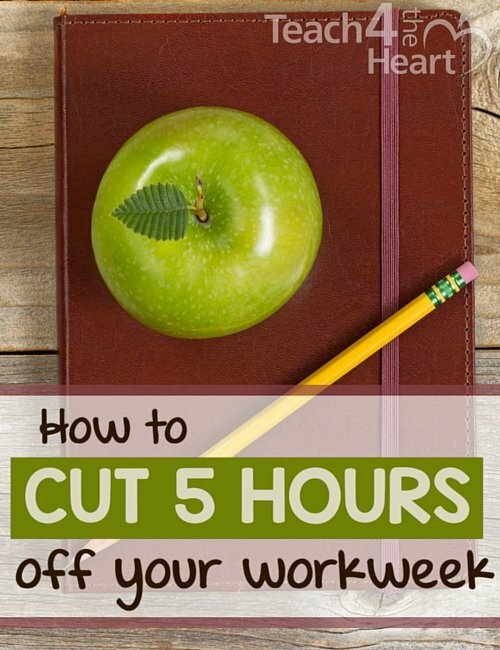 Click here to find out more about the 40 Hour Teacher Workweek Club. 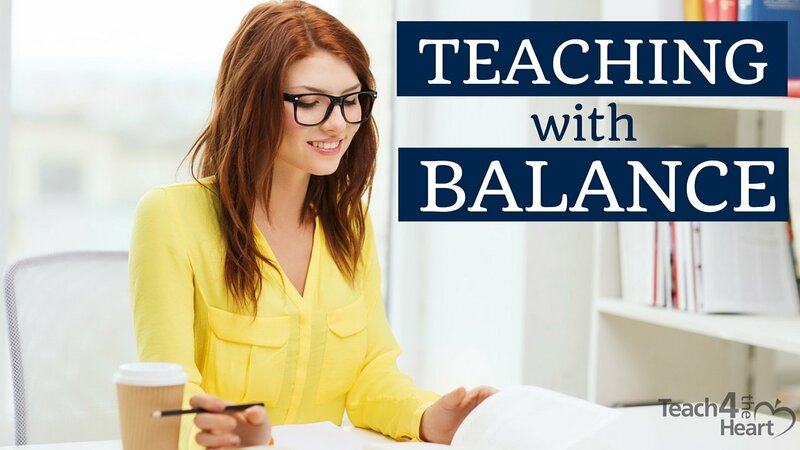 I’ve also just released a brand new video series entitled Teaching with Balance. Click here to watch it now. Turn off my school email right as I’m leaving the building! I can’t tell you how many times I was at home with my family in the evening and got a frustrating email from a demanding parent… And what can I do about it, anyway? I finally figured out that I truly cannot give a good reply without being in my classroom with my student work samples and my files and things. I truly can’t give a decent, thoughtful reply while trying to make dinner or while running errands. Keep the email turned on during the day if you want to, because it IS convenient to check it while standing at the copy machine for instance. But turn it off when you leave and don’t check it again until your planning period the next day. As far as social protocol goes, it’s fine to return the email within 24 hours. Don’t let anyone try to bully you into an immediate response on YOUR personal family time. Plus, I have shaved so much time off my regular work time by simply “batching my emails”. This means I ONLY check email during my conference period when I can quickly look up an answer I need and get it done, one after the other. (Standing at the copy machine is used for deleting the unimportant ones that come through, thus leaving more time to respond to the important emails later).